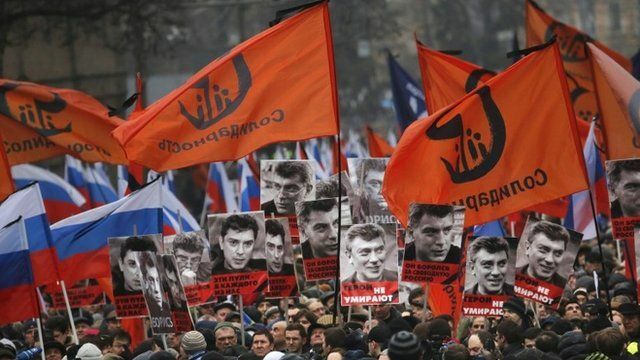 Thousands march to mourn Nemtsov Jump to media player Thousands of people have gathered on the streets of Moscow, mourning the opposition politician Boris Nemtsov, who was murdered in what appears to be a targeted killing on Friday night in the Russian capital. Tributes paid after Nemtsov death Jump to media player People have gathered in Moscow to pay tribute to opposition leader Boris Nemtsov, who was shot dead on Friday just meters from the Kremlin. Kasyanov pays tribute to Nemtsov Jump to media player Former Russian Prime Minister Mikhail Kasyanov plays tribute to Boris Nemtsov, who was shot dead in Moscow on Friday. Kremlin denies Nemtsov death role Jump to media player Dmitry Peskov, spokesman for President Vladimir Putin, says allegations the Kremlin was involved in the killing of Boris Nemtsov are total nonsense. Russians react to Nemtsov shooting Jump to media player People have gathered in Moscow to pay tribute to opposition leader Boris Nemtsov, who was shot dead on Friday just meters from the Kremlin. Thousands of people have gathered on the streets of Moscow, mourning the opposition politician Boris Nemtsov, who was murdered in what appears to be a targeted killing on Friday night in the Russian capital. Mr Nemtsov was a fierce critic of President Putin's support for pro-Russian rebels in Ukraine, and opposition activists have accused the government of involvement in the murder - an accusation strongly denied by the Kremlin.